Few garden styles are as romantic and welcoming as the English cottage garden. To create this look, you will need to choose plants that grow through and around each other, as though they have been growing together for years. Although the overall effect is casual abandon, English cottage gardens require careful editing, if you don’t want to end up with chaos. Here are some top picks for achieving an English garden look. 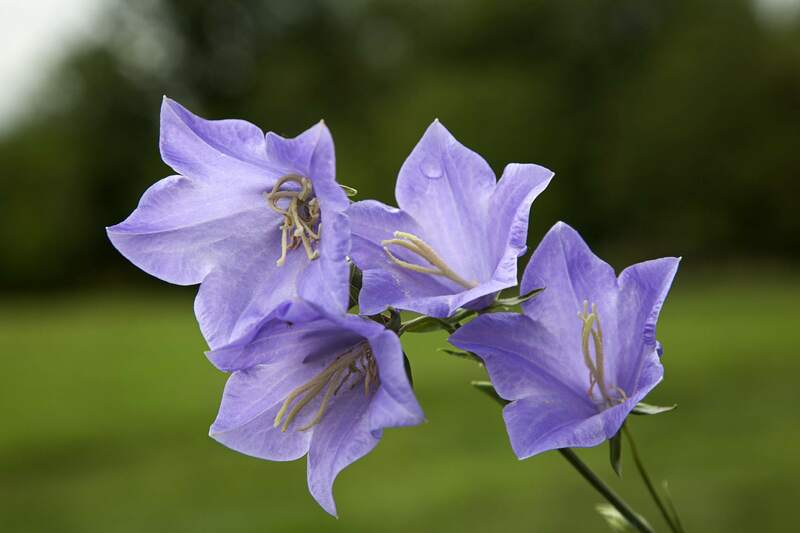 There are several wonderful bellflowers that will light up your garden. The peachleaf bellflower (Campanula persicifolia) stays in bloom most of the summer. Its long stems and abundance of buds make it a great cut flower, as well as a welcome garden plant. Unlike some Campanula species, the peachleaf bellflower does not self-sow to the point of becoming a nuisance but do expect it to pop up in different spots each successive year. They are a welcome sight. Cottage pinks (Dianthus x allwoodii) have the spicy scented flowers and fringed petals so typical of Dianthus species. Pinks are short flowers, so keep them toward the front of your garden border. You will enjoy their scent more if you plant them where you will brush up against them. New varieties are introduced every year, often in non-traditional colors other than pink. They are very drought resistant and because of their fragrance, not usually bothered by animals. However, butterflies love them. Delphiniums can be temperamental plants, but they are worth the extra effort. Although they can withstand quite cold winters, high heat and a lack of moisture during the summer can make them short-lived. These cottage garden standards can use a sheltered spot in your garden, so the tall flower spikes do not get knocked down by wind or rain. Deadhead the spent flower stalks down to ground level, for repeat blooms. Delphiniums will bloom well into fall and can withstand light frosts. Hardy geraniums, not the bright red Pelargoniums sold as zonal geraniums, are low, mounding plants that fill in around the base of taller plants and intermingle with a charming ease. Traditional hardy geraniums bloomed once, although the flowers could last several weeks. Newer varieties, such as the amazing “Rozanne”, will flower throughout the summer, with no deadheading needed. If your plants start to look a little bedraggled by mid-summer, simply shear them back and new growth and flowers will appear within a couple of weeks. There are few cottage flowers that are as delightfully charming as hollyhocks (Alcea rosea). Many gardeners grow them because of their childhood memories of giant plants that could easily reach heights of 8 ft. or more, making them vertical accents for any part of your garden. They also make excellent screens, if you are trying to camouflage an eye-sore in your yard such as an air conditioning unit or a compost pile. You can choose from old-fashioned single flowers and fluffy double flowers. Give your hollyhocks a spot with good air flow. If they remain damp for long periods, they can develop rust fungus. For late season splendor, nothing beats Japanese anemones. Their bobbing airy nature is perfectly at home in cottage gardens. Japanese anemones need a moist, but well-draining soil. The plants can reach 4 ft. tall and may need some staking, especially the double-flowered varieties. “Honorine Jobert”, a white-flowering heirloom, has received a lot of attention lately, but Japanese anemones also come in shades of pink, purple, and rich mahogany. Lady’s mantle (Alchemilla mollis) is a fixture in most cottage gardens. Look for it sprawling along pathways and hiding the lower stems of roses. The cup-shaped leaves have a layer of waxy fuzz that grabs hold of water droplets and rolls them about. Delicate sprays of chartreuse flowers form the perfect complement for the rich green foliage. These are very low maintenance plants. They look better if you remove the flower stalks after blooming and just allow the fanciful leaves to take center stage. English gardens are renowned for their lavenders, such as the much sought after "Munstead", with its purple-blue flowers and the rich purple flowers of "Hidcote". These varieties are well suited to England’s misty, temperate climate. If you live in less than temperate conditions, take heart. There is still a lavender for you to grow. Just keep in mind that more lavender plants die from too much water than from too little. Give them well-draining soil. Although peonies have a brief flowering period, they are so stunning and fragrant when they are in bloom, nothing else in the garden matters. The foliage can look good the rest of the season, particularly when the leaves turn red in the fall but watch out for botrytis, or gray mold, in humid conditions. Peony plants can live for decades if they are happy in their surroundings. Garden phlox (Phlox paniculate) are stars in the heat of late summer. Their flower clusters can last well over a month. Older varieties of phlox were prone to powdery mildew, but thankfully they have bred new types that stay beautiful no matter how humid your summer gets. The Hummingbird Moth is a phlox pollinator, so expect some visitors. You can’t get much more British than the primrose, an early season bloomer with some of the brightest flowers of spring. Primrose are woodland plants and will happily naturalize under trees, but any lightly shaded spot will do. The English primrose (Primula vulgaris) can produce multiple flowers per stalk and comes in a wide choice of colors. There are also flamboyant Japanese Primroses (Primula japonica) that can reach 3 ft. tall and the extremely hardy cowslip (Primula veris) with fragrant yellow flowers. It’s hard to imagine an English garden without roses. 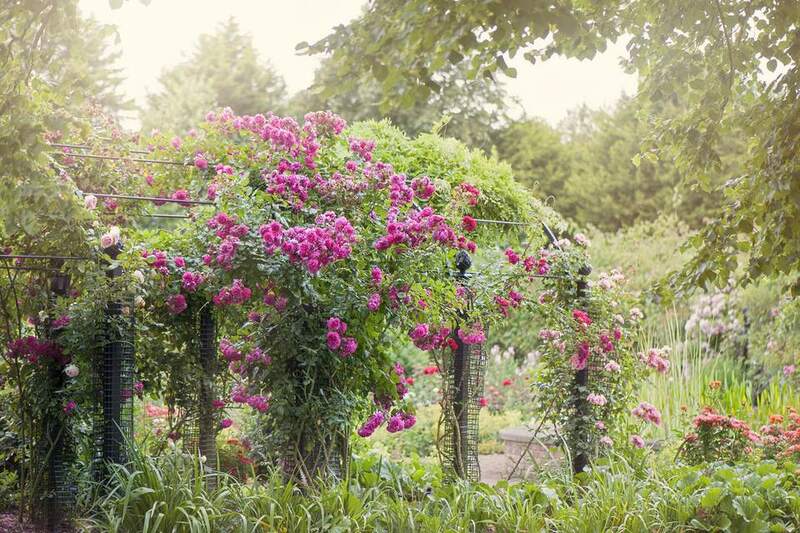 Climbing roses that have an arbor or arch to climb over will definitely lend a cottage their garden charm. Shrub roses can do double duty as support for sprawling plants and delicate vines like clematis. Be sure to check out some of the modern English roses with their disease resistance and their heavenly scents.